John Kelly was sworn in as President Donald Trump's chief of staff on Monday, bringing more than 40 years of military experience to lead the White House staff. Trump praised Kelly's work as secretary of homeland security during the first six months of his administration, calling it "record shattering," CNN reported. "You look at the border, you look at the tremendous results we've had, and you look at the spirit," Trump told reporters while sitting with Kelly after the swearing in ceremony. "And with a very controversial situation, there's been very little controversy, which is pretty amazing by itself." Trump congratulated Kelly for his new position and said he looks forward to more success with his new chief of staff. The president also said that his administration has "done very well," citing the stock market's performance, low unemployment numbers, and business confidence, before he added that Kelly will add strong leadership to the White House. "We will proceed and we will keep going, but we have a fantastic leader, chief of staff; he is going to do a really great job," Trump said. 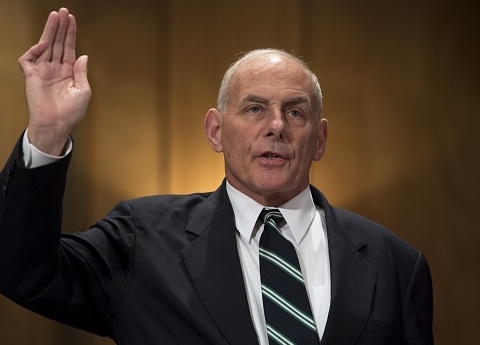 CNN noted that Republicans on Capitol Hill hope that Kelly, a retired four-star Marine general known for his "fastidious nature," will bring order to what many in Congress view as a chaotic White House. Trump pushed back against the idea of a chaotic White House on Twitter on Monday, reiterating his positive views on his administration's performance regarding the state of the economy, the stock market, and low unemployment. He capped off the tweet by adding, "No WH chaos!" Trump announced Friday that Kelly would replace Reince Priebus as White House chief of staff. "I am pleased to inform you that I have just named General/Secretary John F Kelly as White House Chief of Staff," Trump wrote on Twitter. "He is a Great American and a Great Leader. John has also done a spectacular job at Homeland Security. He has been a true star of my Administration." Before retiring from the military, Kelly served as the commander of United States Southern Command for four years under former President Barack Obama and as a commanding general in Iraq from 2008 to 2009. He served as secretary of homeland security for the first six months of the Trump administration before becoming White House chief of staff. This entry was posted in Politics and tagged Donald Trump, John Kelly, Reince Priebus, Trump Administration, White House. Bookmark the permalink.